Silk HASEGAWA presents Spun silk 100% jersey knitted by our own stock yarn ZEN. This is very rare top dyed mélange jersey, 125 centimeters wide, 150 grams per square meter with 70 colors on stock. <ZEN> Top dyed yarn is spun with colored raw materials. It mixes exactly according to the recipe and make it into a deep luxurious yarn. We use 100% of the finest "extra-grade silk" raw material which only HASEGAWA possesses. Dyeing with raw materials in Japan, color mix by strict manufacturing recipe with our own special equipment. This is super high quality ultra-fine yarn. Grace is made by using "ZEN" as the base yarn and knitted in-house, finishing with special finishing, it is an ultra-luxurious finest jersey with authentic glow and fine precious drape. 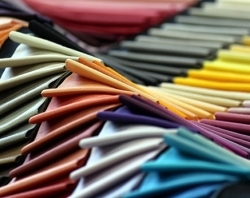 Since all colors are always in stock, you can purchase immediately from each color 1 meter. Dress, stole, muffler, gloves, accessory craft etc, design with your favorite color is possible. Both overseas and domestic super-first-class brands have been using HASEGAWA "Grace" for many years. Please enjoy the same quality/colors.